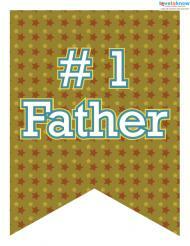 Consider including a Father's Day banner as part of your party decorations or as a simple way to greet Dad on his special day. You can purchase different designs and styles of pre-made banners, or you can make your own using craft supplies or your computer printer. The free banners offered here can easily be downloaded and printed using Adobe. Printing on card stock creates a more durable banner, but you can also print on paper if you wish. Each design can be used separately if you're limited on space or want to hang individual banners throughout the party area. If you prefer, you can string all three banner designs together using one of each style, or you can use multiples of each style in a repeating design that fills a larger space. If you'd like to make a banner for Father's Day, there are many ways to create something unique and special. Here are some suggestions that will delight any dad. Free printables can be a great help when you want to make banners. All you have to do is download the various templates, print them out, and then color or decorate them. You can use paints, colored pencils, crayons, glitter, or any other craft supplies you have on hand to decorate the printed pages. String them together and you've created a beautiful, original banner. Try some of these sites for banner templates. Quality Kids Crafts: There are three different banners here. Print out the letters individually and then cut them out to create the banners. Delightful Designs: If you're running short on time, this "Super Dad" banner doesn't require any coloring, although you'll need to have a color printer on hand. You can make it into one long banner, or split it up into two smaller banners depending on your available space. Balloon banners are a really nice option if you have a large space available. For example, an entire wall or a large outdoor fence would work perfectly. Using a marker to add a letter to each balloon, inflate enough brightly-colored balloons to spell out your message and attach the balloons to your surface with strong tape or pushpins (pinning the rubber "tag" where the balloon has been tied off). If you're using a wall or other surface that you don't want to risk ruining, the balloons can be glued or taped to sheets of cardboard instead, which can then be mounted on the wall or placed along a mantel or other ledge. Control the size of the finished banner by using small or large balloons, or inflating them only part of the way full. A golf-theme banner could include images of golf clubs and golf balls with the saying, "Hole-in-One Dad." If dad is a handyman, use pictures of tools and toolboxes. Sports-minded fathers would enjoy images of their favorite sports like basketball, football, baseball or hockey, or you could use the colors and logos of their favorite teams. Fathers who like to cook outdoors will appreciate a hand-drawn image of dad at the grill. You can make it funny if you wish by adding flames jumping out of the grill's surface. For a Western theme, add images of cowboy hats and boots, horses and metallic stars. 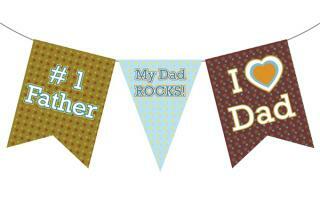 Flagsrus offers Father's Day designs that include grills, boxers on a clothesline, and "World's Best Dad." Prices range between $11 and $25, and you can choose between indoor and outdoor banners. FlagandBanner.com offers a nautical-theme banner that features a lighthouse against a harbour background and costs just over $12. Shindigz offers horizontal and vertical Father's Day banners with various themes, including sports, grilling, rock and roll, and more. Pricing begins around $15 per banner. If you're planning to order your banners online, make sure you check the estimated delivery dates to ensure they will arrive on time. Also check shipping costs, which can quickly add up and make your purchase quite a bit more expensive. 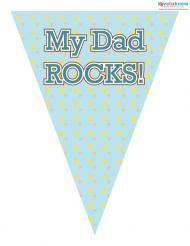 Hanging a banner offers a great way to make a big statement, and Father's Day is the perfect occasion to do so. 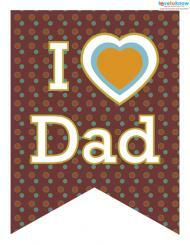 Tell your father how special he is with an eye-catching banner, purchased or homemade, hung in a highly visible spot.